I visited the “Future Beauty – 30 Years of Japanese Fashion” exhibition at GOMA to sketch so many times that I am sure the attendants thought I was going to bring out my own range. There was such a range of creative work, so beautifully imagined and presented, that I could have continued for many more months. Matching the media to the design made sketching slightly less daunting. 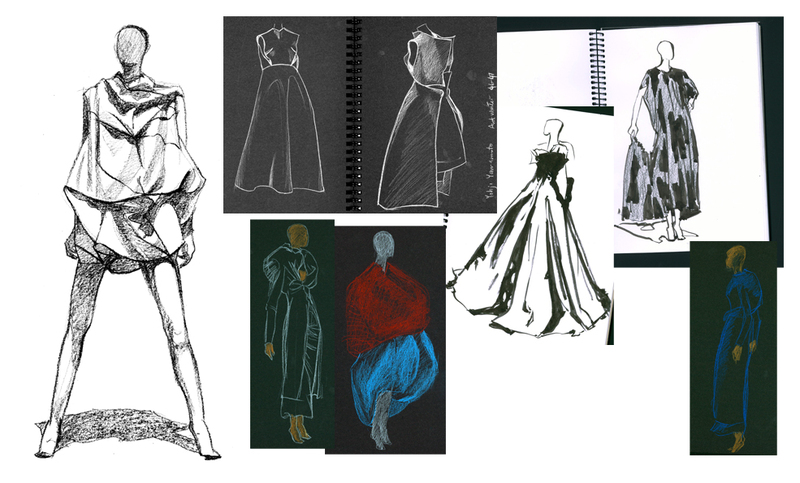 Brush and ink, and pencil worked well for Yohji Yamamoto’s designs, Issey Miyaki’s architectural folds were a draughtsman’s delight, and the only way I could think of rendering Junya Watanabe’s etheral design was scribbling in manganese blue and cadmium red pencil. Drawing Rei Kawakubo’s designs was fun, pure and simple. Much though I coveted many of these dresses, the likelihood of my ever owning one is extremely remote. By drawing them however, I will always own them in my imagination. Love your sketches Jane. Pastels/charcoal on black paper always look wonderful. I adored the exhibition too.